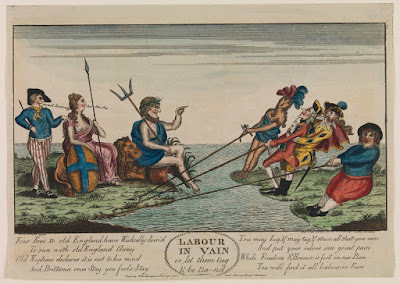 Labour in vain or let them tug & be da--nd, W. Richardson, 1782, Library of Congress. 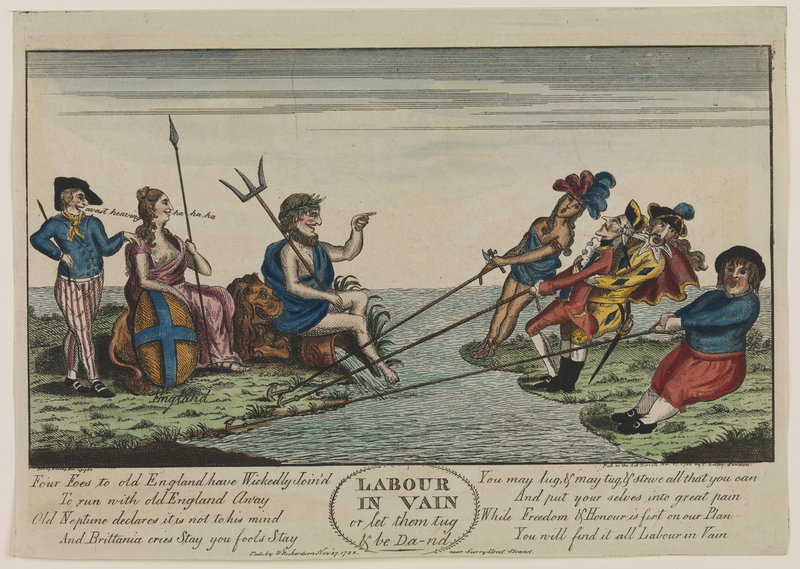 Labour in vain or let them tug & be da--nd, Thomas Colley, 1782, National Maritime Museum. Print shows Neptune, the British lion, Britannia, and a British sailor on a piece of land labeled "England" laughing derisively at a Dutchman, a Frenchman, a Spaniard, and a partly draped Native woman wearing a feathered headdress, representing America, who are tugging at taut ropes hooked onto English soil. Once the former American colonies had secured European allies, fears of invasion in England caused the Crown to reevaluate its strategy. The artist is here dismissing concerns of a European invasion by claiming that the British could handily defeat their opponents. Looking on with an amused expression of contempt, and causing Britannia to laugh at his command of 'Avast heaving,' is a typical British tar. His cocked hat is reversed, revealing short cut hair. A yellow neckcloth is tied about his neck, draping onto a double breasted jacket that ends at the waist with slashed cuffs buttoned closed. 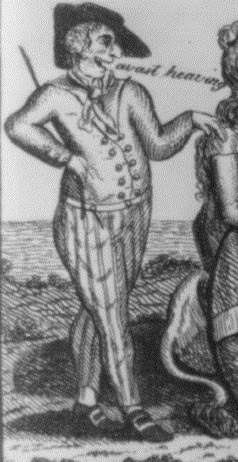 Unusually tight fitting trousers, decorated with vertical stripes, is sewn with a broad fall fly. Tucked under his arm is a stick.